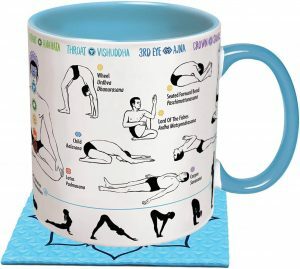 Take just one look at this mug and you know instantly that it is perfect for anyone who is a yoga aficionado. Coffee or tea – whatever your beverage of choice – it is sure to taste that much better when sipped from your yoga mug. This is a 12 ounce sized mug that is safe for both the dishwasher and microwave. The outside of the mug depicts yoga poses for each of the chakras on a white background as well as the sun salutations. Included with the mug is a coaster that is in the shape of what else? – a yoga mat! The coaster is an attractive light blue and matches with the color of the inside of the mug. The manufacturers definitely have an eye for detail which is especially noticeable when you see the box that the mug is in. It’s stylishly attractive and has just the right amount of color and eye-catching graphics. Even if you are not into yoga, you might want to consider picking up one of these mugs as a gift for a friend or family member. Any yoga enthusiast, no matter if they are easy or difficult to buy for, will be delighted to receive this mug and use it as a beverage container. You may also find that your gift becomes one of the most talked about.